Learn more about the Sound Maze and its creators, below. 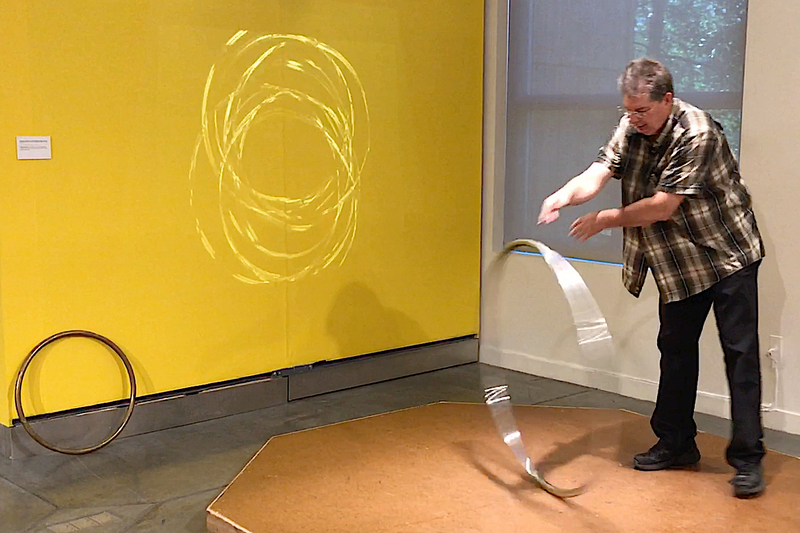 Listen, play, and discover sound anew as you improvise with a dozen newly invented musical instruments in an interactive installation created by composer and inventor Paul Dresher in collaboration with Daniel Schmidt. Designed for all ages, all levels of musical experience, and all types of minds, this hands-on installation lets you experiment with extraordinary inventions to discover new ways of creating sound and music. Admission $10; 16 & under $5; Members FREE. “What would happen if….” is a question I’ve been asking since I started inventing musical instruments in high school, many decades ago. While I have always played and loved traditional musical instruments, I’ve always been intrigued by new sounds as well. This curiosity led directly to musical composition and it’s from a composer’s perspective that most of my inventions have arisen. But, like an improvising musician, I also love the process of building itself, working with my hands and experimenting with raw materials in the hopes of discovering something sonically and/or visually interesting than could then be used in a composition or theatrical work. The creation of all these instruments started with that “what would happen if ” type question, such as “What would happen if we greatly increased the size of a musical instrument, such that the instrument holds the musician, as opposed to the other way around?” One possible answer was the giant pendulum structure. Or I was simply intrigued by the sound of wood blocks and out our experiments different ways of building and playing wood blocks came the “Field of Flowers”, the “Big Wheel” and parts of the “Percussion Table.” Sometimes the question is one of avoidance, such as “What can we do with a pipe organ if we don’t use the usual keyboard?” Every instrument starts with its own question, one to which there are many possible answers and while none of them are wrong, only a very few of them end up being developed into an instrument we use. (And our workshop is filled with “failed” experiments that are almost as essential as the successful ones). In fact, most of these inventions – which are the result of a long collaboration with inventor, craftsman and composer Daniel Schmidt – had their genesis as both the musical instruments and theatrical sets of experimental music theatre works in which the entire stage is filled with invented musical instruments. The first of these was Sound Stage (2001), a commission from the Twin Cities based new music ensemble Zeitgeist and the Walker Art Center. The second, Schick Machine (2009 and still touring), was a commission from Stanford University that was created by a team of collaborators that included myself, Daniel Schmidt, writer/director Rinde Eckert, visual/set/lighting designer Thomas Ontiveros, mechanical sound artist Matt Heckert and the virtuoso percussionist (and sole performer in the work) Steven Schick. And in fact, the Sound Maze is a direct outgrowth of these two works. The premiere of Sound Stage in Minneapolis in 2001 took place in a dance venue, one in which the audience sat on bleachers and exited the theater on the stage level. At the end of the show, most of the audience streamed on-stage, wildly curious about the inventions. Knowing they were robust in their construction, I said it was fine for the audience to play on and experiment with them. This became an essential part of every subsequent performance. The wild curiosity and energy that consistently happened during these post-performance audience hand’s on sessions eventually led to the notion of trying to offer the instruments as a stand alone hands-on installation experience, without any formal performance. When I first started inventing as a teenager, I was motivated purely by the sonic attributes of the inventions. I was unaware at that time that I was actually quite concerned about the visual aspects of the inventions. It wasn’t until I had spent about 15 years as a composer/collaborator on large-scale new opera and music theater works, that I consciously realized the potential visual impact of invented instruments. Thus when I started work on the “Sound Stage” in 1998, I was finally aware that the impact of these inventions depended upon a combination of the physical design, the mechanical or kinesthetic means of activating sound, and lastly, the sounds themselves. In most cases, all of these are essential to our engagement with the inventions. While I have always thought of myself as composer and sound artist, I’m thrilled and honored that here at the Napa Valley Museum, the inventions are being presented in a museum setting. Additional thanks for important contributions to the creation of these inventions goes to Alex Vittum, Robert Reetz, Keith McMillen Instruments, and Helen and John Meyer of Meyer Sound. Paul Dresher is an internationally active composer noted for his ability to integrate diverse musical influences into his own coherent and unique personal style. He pursues many forms of musical expression including experimental opera/music theater, chamber and orchestral composition, live instrumental electro-acoustic music, musical instrument invention, and scores for theater and dance. A recipient of a Guggenheim Fellowship for 2006-07, he has received commissions from the Library of Congress, Saint Paul Chamber Orchestra, Spoleto Festival USA, the Kronos Quartet, the San Francisco Symphony, Zeitgeist, San Francisco Ballet, Seattle Chamber Players, Present Music, and Chamber Music America. He has performed or had his works performed throughout the world at venues including the New York Philharmonic, Los Angeles Philharmonic, the Festival d’Automne in Paris, the Brooklyn Academy of Music’s Next Wave Festival, and the Minnesota Opera. Recent works include Crazy Eights & Fractured Symmetries which was commissioned and premiered by the Berkeley Symphony in October 2016, Family Matters (2014) – a duo for TwoSense – cellist Ashley Bathgate and pianist Lisa Moore, Concerto for Quadrachord & Orchestra (2012) composed for conductor Joana Carneiro and the Berkeley Symphony, a major piano work – Elapsed Time (2011) – commissioned by pianist Sarah Cahill and premiered at the Spoleto Festival, and Schick Machine (2009) a music theater work for percussionist Steven Schick and performed on a set comprised of invented musical instruments/sound sculptures and created in collaboration with writer/director Rinde Eckert, inventor Daniel Schmidt and mechanical sound artist Matt Heckert. Daniel Schmidt is a musical instrument inventor, composer and musical educator. His inventions have been exhibited at the Exploratorium in San Francisco, Akademie der Kunst in Berlin, the San Francisco Art Institute, New Langton Arts, EXPO ‘86 in Vancouver, Dartington College in England, and the Cornish Institute in Seattle. In addition he has built musical instruments for John Cage with the Boston Symphony, John Adams and the San Francisco Symphony, and worked closely with composer and inventory Lou Harrison on a number of projects. Daniel is well known for his contribution to creating the genre known as American Gamelan, broadening the range and timbral palette of traditional Indonesian designs and making the instruments more well-suited to the western compositional approach. He has long been a leader in field of American Gamelan & Javanese music, and in that capacity has directed performances or had residencies at the Cabrillo Music Festival, the Oakland Museum, the Exploratorium, New Music America in San Francisco and Los Angeles, UC Berkeley, California Institute of the Arts, and the Berliner Kunstler Program (DAAD). Since 1976 Daniel has been involved with numerous educational institutions in a wide variety of roles. These include East Bay School for the Arts (10 years); East Bay Science and Arts Middle School (2 years); Cazadero Summer Music Camp (6 years); and a pilot program at The Berkeley School in 2012. At the college level, he taught at UC Berkeley (5 years); UC Santa Barbara (4 years); Sonoma State (8 years), and has been teaching at Mills College since 2008. His work with Paul Dresher has brought about two significant new instruments, the Quadrachord and the Hurdy Grande. They have also developed instruments for specific use in two large theatrical productions – Sound Stage (2001) and Schick Machine (2009). In 2009 Daniel designed and built a permanent installation of unique instruments at Children’s Fairyland in Oakland. These sight-specific instruments engage children in a broad range of musical exploration. He has collaborated with numerous choreographers and dancers including Anita Feldman, for whom he built a special tap-dance floor, and Joanne Kelley with the San Francisco Ballet. Articles by and/or about his work have been published in Experimental Musical Instruments, EAR Magazine, Soundings, Percussive Arts Journal and the New Grove Dictionary of Music. He has received grants from the NEA, Meet the Composer, and the California Arts Council. Presently he is finishing an article on the origins of American Gamelan for the Smithsonian. 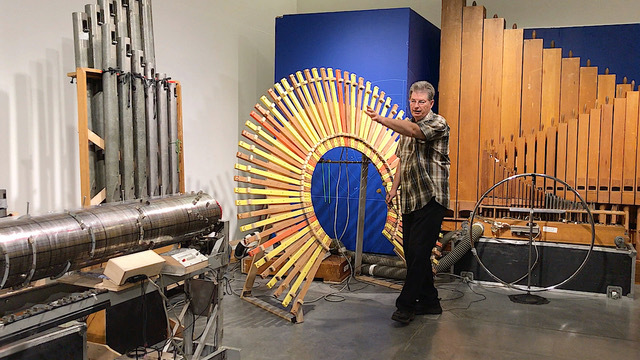 “In 2009 I visited Paul Dresher’s studio to see his invented instruments. I was very struck by their visual impact, and made several videos of the instruments in action. I particularly loved both the sound and the look of the instrument called Octagon, a steel wheel that when well initiated, spins seemingly endlessly within the borders of its octagonal confines, eventually thudding to the ground with a sound like a drumroll announcing its finale. I videotaped this spinning many many times, and edited the video in After Effects so the many overlapping spins created my piece, which I titled “Spinning”. 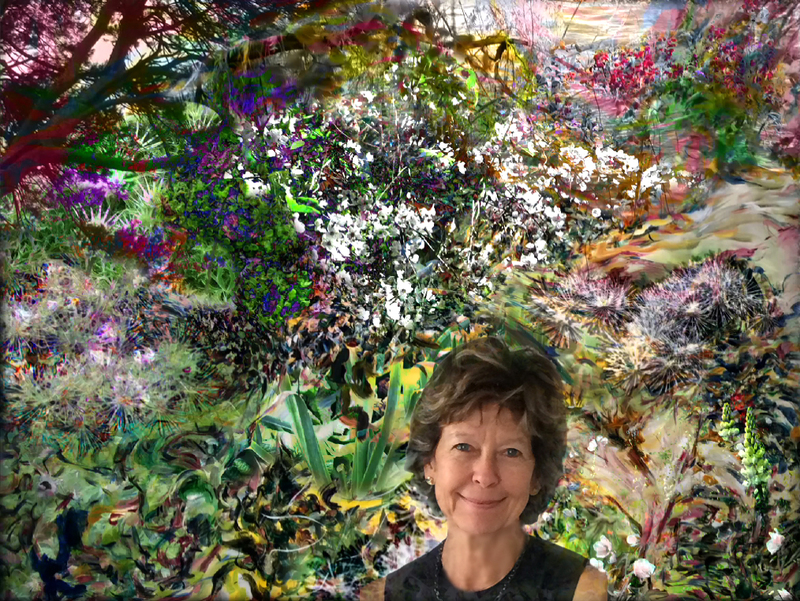 A painter, video artist, and stage designer, Naomie Kremer has exhibited widely in the US and abroad. Her work is in many private and public collections, including the Whitney Museum of American Art, The Berkeley Art Museum, The Fine Arts Museums of San Francisco, and the US Embassy, Beijing, China. Her video based set designs include the recent production of Alcina, by GF Handel, performed in Acre, Israel by the French Baroque orchestra Les Talens Lyriques; the world premiere production of The Secret Garden co-commissioned by San Francisco Opera and Cal performances; Light Moves, a collaboration with Margaret Jenkins Dance Company; and Bluebeard’s Castle by Béla Bartók, commissioned by the Berkeley Opera. Vivid with motion and color, Naomie Kremer’s imagery is based in the real world, incorporating nature, architecture, language, letterforms, and the human figure. 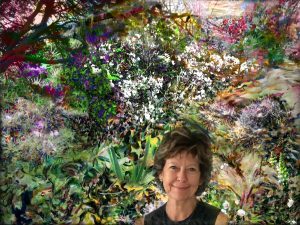 Her work draws from a wide range of sources and inspirations, including art history, music, poetry and literature, translating her experience through the language of abstraction. Born in Tel Aviv, Israel and raised in Brooklyn, NY, Kremer has lived in the Bay Area since 1977. She received her MFA in Painting in Drawing from California College of the Arts in 1993. She is represented in San Francisco by Modernism Gallery; New Orleans and Houston by Octavia Gallery; Aspen by 212 Gallery; and Dusseldorf, Germany by Von Fraunberg Gallery. www.naomiekremer.com.